In keeping up with the most advanced technology and providing our patients with the best care, we recently purchased and installed an Optical Coherence Tomography (who comes up with these names??) or OCT in our clinic. This test that can help Dr. Steve diagnose and manage retinal and macular conditions as well as glaucoma early in the disease process. Most eye diseases that can lead to irreversible blindness such as glaucoma, diabetic retinopathy, and macular degeneration tend to develop without any pain or decreased vision in the early stages. The later the disease is detected the harder it is to treat. 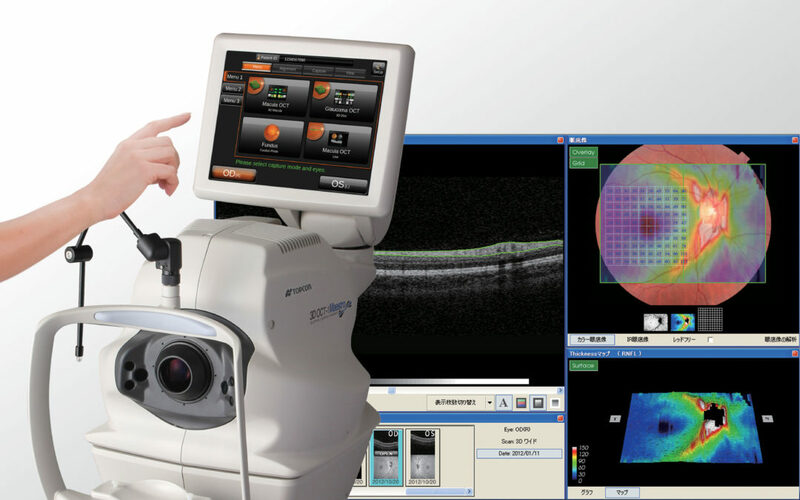 The OCT test uses light to safely scan the retina, macula and other structures that line the inside of the eye. Once the scan is complete, the computer generates a highly detailed, cross sectional image of these structures. This is different from the retinal fundess photos that we have always taken which only give a picture of the surface of the retina, without allowing us to view the layers below the surface where the disease process starts. Dr. Steve is excited as a kid on Christmas Eve to play with his new high-tech device! Please click here to see a video on the OCT.